I had an email recently – one photo, a fairly close up shot of a 1970’s Acorn freestanding wood stove on a brick and tile hearth. A picture does tell a thousand words – but our industry is extremely complex and usually, it takes two or three good photos to paint a picture for ballpark and budgeting sakes’. This will give you, in round numbers, what you can expect to spend on a safe fireplace installation. In this blog, I’m going to outline this a bit better, because so often we ask “for pictures” without giving a really good idea of what we’re looking for. Service is extremely important to us, so we’ve selected a specific geographical area that we service and install so that we can achieve positive results for service – usually a one to two-week lead-time during the busy season, within a certain number of kilometers to the store. As far as a supply only relationship (cash and carry), we take our friendships with other dealerships who are outside of our area seriously, so we may ask you politely to deal with one of them as you may be on the “bubble” of our service area. We may feel you’ll get the best after-sales service and support (and that’s a huge value right there!) 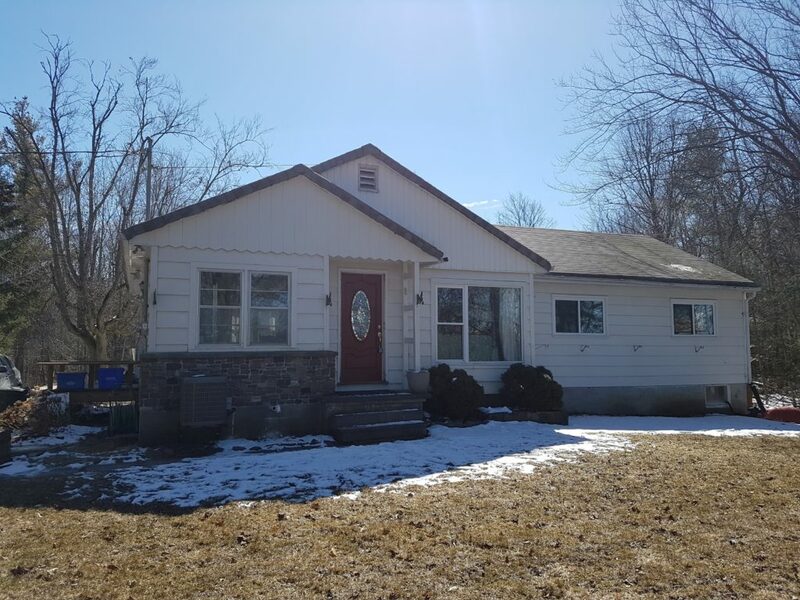 from someone closer to you, so please don’t be shy about giving us at least the township the installation address is happening in– we aren’t going to send you a bunch of fliers or sell the information to anyone, we just may have a referral or give you the confirmation that you are indeed in our service area. This information trumps all. 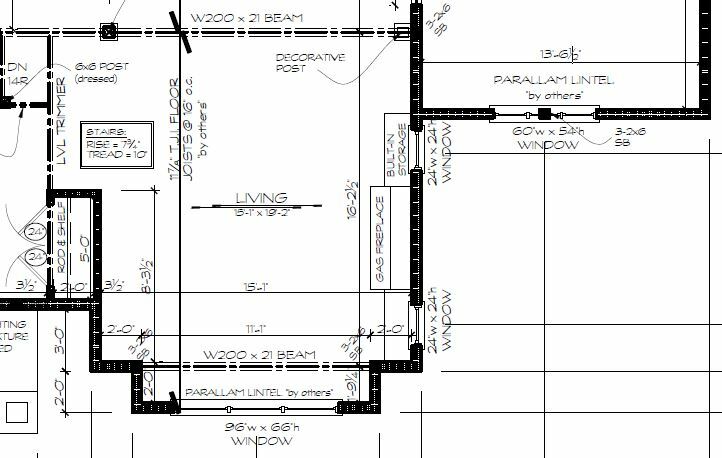 If you have a package of permit ready drawings from a designer where there is an outline of where the fireplace is to be installed and elevations of the exterior of the home, just make sure it’s packaged as a PDF and click forward with some information such as the street address of the renovation/new build and some contact information for yourself. You’re done! So, you don’t have drawings…no problem! Because we have a local area, please indicate in your email requesting a quote at least what municipality or township that you’re requesting an installation in. With Google Maps, we’ve even found that a postal code can give some working idea of the location – and we don’t share or sell this information. You may be open to anything – wood, electric, gas, propane! And that’s totally fine. But please tell us what different fuel type(s) you’re interested in being quoted on so we can be looking for all the right details in the photos and description that you provide. Our family has purchased a new home in Otonabee South Monaghan and we just got the keys last Monday. We have a huge renovation going on in the main floor of the home, so we are hoping that there’s a bit of a budget-friendly option for our downstairs fieldstone fireplace – and we’re attaching photos – what would our costs be? We’re mostly open to electric. 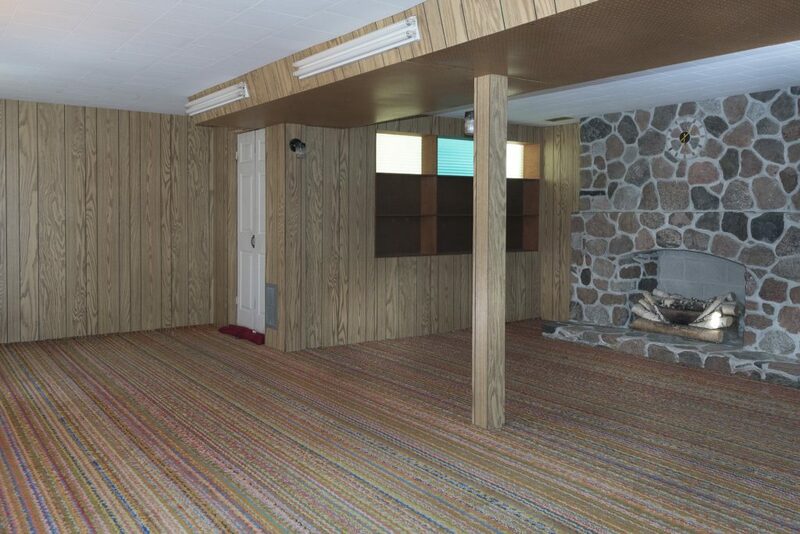 We’ll be painting the basement and doing carpeting. We’d like to mount our flat screen TV above our fireplace, and don’t like how the power for the electric log set looks cluttered now. 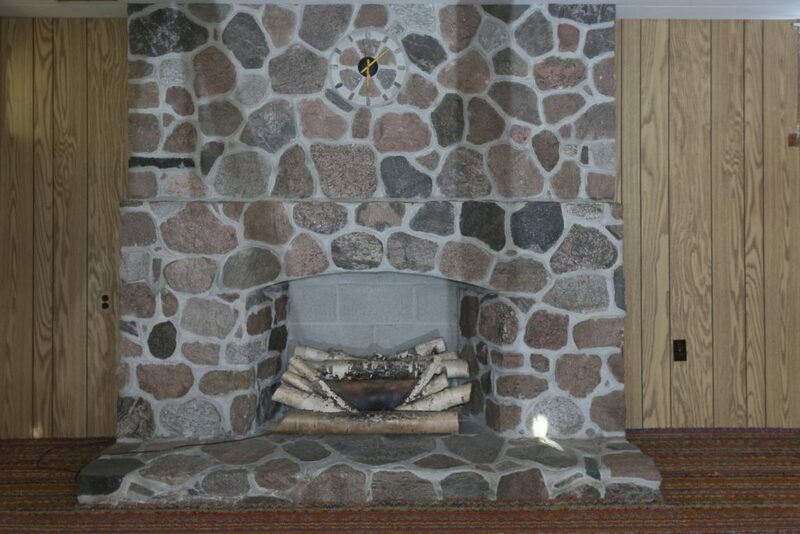 Store observations: this stone fireplace is massive! One of the first details is that whoever the owner was previous, they have probably used power bars/extension cords in the past to power the existing fake electric log set that currently sits in the fireplace cavity. Barring any budgetary reason not to, we like to see what it would cost to hide the wiring for our proposed electric insert, as well as to hide the wiring for the television set – this may mean two receptacles, and maybe more labour on a masonry fireplace than the electrical contractor has appropriate tools to do, so we’d make sure to also get the masons we work with to put their thinking caps on. -quote on the cost to take the client supplied TV mounting bracket and A) make sure that the fireplace was ready for the electrician’s visit and B) mount the TV bracket using appropriate fasteners. -have the client self-install the TV on the mounting brackets after the renovation is completed, using the electrician supplied receptacle to plug in to, or quote on the electrician doing two trips if the television isn’t on site at the time of the electrical work. We love it if you send photos of your home – even just the front of your home from the street – so that we can give our installers some idea of what your home looks like as they’re trying to find it. From this photo, we can also tell what the house looks like from the highway, what the roofline of the house is like, what material is installed on the roof (shingles), and again, that’s extremely handy information to have – right from one photo! If this was for a wood chimney and stove installation quote request or even a natural gas or propane fireplace quote request, this photo and the one after it would probably tell me most of what I need to know to quote. From this photo, I can see what the area looks like that you want the fireplace in and in this specific case, I know approximately what height you’re wanting the mantel to be installed at. 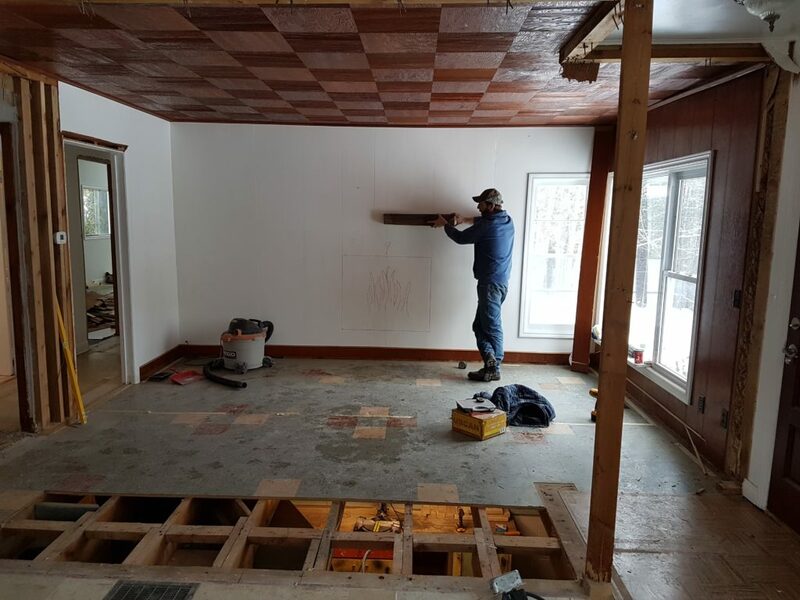 Because of the nature of this particular renovation, I can also see which ways the floor joists run, which is handy for figuring out wiring and gas piping run for a turnkey installation. Please keep in mind that we’re not wanting these photos or this homework to be performed by you because we don’t do an on-site or pre-installation inspection – the opposite is true, we try our hardest to get out to every site that we can to inspect and quote – these photos and a short email outline will give us most of the information we know so that we can get you a professional and proper fireplace quotation that we can discuss with you!